An increase in ticket checks and the introduction of on-the-spot fines has seen a major decrease in fare evasion on Victoria’s public transport network. Public Transport Victoria (PTV) chief executive officer Mark Wild says fare evasion rates are falling sharply as a record number of authorised officers has increased the number of tickets checked by 61 per cent. "Authorised officers are now checking more than one million tickets per month," he says. "The introduction of on-the-spot penalty fares allows offences to be processed quickly and efficiently. "Of more than 140,000 people who were caught freeloading in the past six months, 28 per cent chose to pay the on the spot fine. "We also have more authorised officers on the network than ever before, with the introduction of 70 multi-modal authorised officers last year bringing the total to more than 600. "Authorised officers also assist customers with information and provide a visible security and safety presence." PTV’s October 2014 fare compliance survey data found the network-wide fare evasion rate has reduced significantly to just 5.9 per cent, the lowest rate since surveys began in 2005. "The latest fare compliance data is extremely encouraging," says Wild. "Victorians value public transport and understand that fares are essential to a sustainable system. "More than 94 per cent of customers are paying the right fare but there are still some that don’t. "That’s why this month sees the next phase of PTV’s ‘Freeloaders’ public awareness campaign, which ran to great effect last year." The ‘Freeloaders’ campaign was developed based on research conducted by the Institute of Transport Studies at Monash University, and targets repeat, high-frequency fare evaders with the message that it’s more likely than ever that they’ll be caught and fined. Research shows this campaign has resonated with PTV’s target audience, with 49 per cent of those surveyed responding they would be less likely to fare evade after seeing the campaign. "The actions we are taking on all fronts are building momentum," says Wild. "Fare evasion still costs us around $51m per year and that’s money we could use to improve the system for everyone." 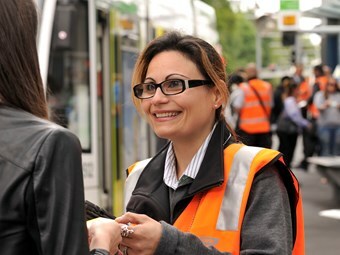 PTV will continue to work with operators to increase fare compliance by delivering improved strategies on all modes, including more plain clothes enforcement, improved bus driver vigilance and more checks at stations and stops. Over the six months from August 2014 to February 2015, authorised officers in the metropolitan area checked 6,743,300 tickets across Victoria. In total 103,229 reports of non-compliance and 41,001 on-the-spot penalty fares were issued.